It’s not just about trains. Some of our members have incredible backyard landscapes. 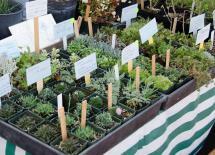 Join the special interest group on plants and learn more. With setups all around the year at train events, garden shows, and more, there’s always a chance to run your trains and show off your models. Many of our members enjoy running trains powered by real steam. Find out more about this fascinating hobby. Please log in to access members-only content, such as newsletters. Forgot to renew? Send in your renewal today! It’s still only $25. Never logged in before? You should already have an account. Click here to reset your password. Contact us if you still need help logging in. Sign up to receive information about public events! 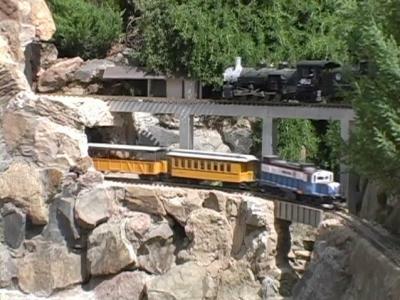 Since its founding in 1988, the Sacramento Valley Garden Railway Society has helped garden railroaders enjoy their back yards even more with large scale trains running through them. 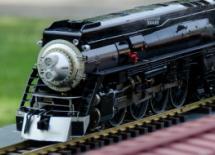 Sounds of trains running through loops of greenery enhance the entire garden experience. We now have members in Butte, El Dorado, Nevada, Placer, Sacramento, San Joaquin and Yolo Counties. We always welcome new members, and are able to spare you mistakes that we have all made. Join the club and take part in this incredible hobby! 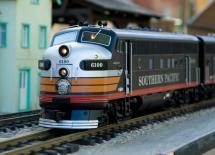 SVGRS members enjoy the opportunity to particapte in the social aspects of garden railroading all year around. Our typical schedule includes monthly meetings at member’s homes, open house railroad tours around Sacramento Valley, a fall BBQ, a December potluck, January dinner, February clinics, as well as numerous public events where we setup our modular table. We also have work days to help each other out, exclusive G-scale equipment swap meets and sales to members, members-only articles, and numerous tools and resources to borrow. Join the club today!